What is a Baitcasting Reel? Can You Find a Quality Reel For Less Than $100? Fishing on a budget isn’t the easiest thing to do. Acquiring the necessary pieces of gear can get real expensive, real fast. But for those of us who need a little more bang for our buck, there are plenty of great products on the market that are sold at a reasonable price. This article will walk you through some high-quality budget baitcasting reels. A baitcasting reel is recognized by anglers for its accuracy and power, but also for the difficulties associated with using it. They are traditionally used by more advanced anglers, but anyone seeking an extra challenge can use them. Upon learning the ropes of the baitcaster, it’s a reel style that can reap many benefits. These reels are commonly utilized in the hunt for large catches. They handle heavy line well, which is often a requirement of trophy fishing. They’re also known for providing extremely accurate casts because there is more manual involvement. It is absolutely possible to find a high-quality reel for a modest price; it just requires a little more work on your part. There are angling companies like KastKing and Piscifun that have made affordability a major aspect of their business missions, without sacrificing the quality craftsmanship that makes their products effective and attractive. Be very careful when purchasing super cheap knock-off reels or a product from a company you don’t recognize. You’re better off going with a trusted brand that has made a commitment to affordable products. That $15 reel you found on Amazon may be very tempting, but at that price, it probably won’t look like it does in the product photo or function the way it’s supposed to. The first thing to consider in your budget baitcasting reel is the weight. It should be matched with the rod you’re planning on using to help with the balance. If you purchase a reel that is too heavy or too light, you’ll be left with wonky casts and unnecessary frustration. Ball bearings play a huge role in a baitcasting reel’s casting abilities. Most reels range from having 1-15 bearings. Having more can result in a smoother cast, but only if they’re quality made. Depending on the species of fish you’re hunting, a powerful drag system will be more or less important to you. Overall, a good reel will offer a drag power of at least 10-15 pounds. Originally developed as tournament-ready baitcasting reels for bass fishing, the Elite series went through extensive field tests to achieve the design and functionality it has today. The Royal Legend is the smallest of them; its “palm perfect” design is made to fit the curve of your hand and wrist perfectly. The casting system includes 11 stainless steel ball bearings, which are double-shielded for protection. It also has one instant anti-reverse. Like many high-performance reels on the market, the Royale Legend has a stainless-steel kick lever and main shaft. The Royale Legend Elite reels come in four different gear ratios, including 5.3:1, 6.6:1, 7.3:1, and 8.1:1. Each reel is conveniently color-coded to reflect its ratio, making it easy to switch back and forth between one or the other for different angling styles. The drag system included is a smooth carbon fiber disc drag, offering up to 17.5 pounds of stopping power. It also has an adjustable magnetic braking system for easy cast control. Quality isn’t compromised in KastKing’s Royale Legend from the Elite series. With a comfortable ergonomic design, quality drag system and ball bearing count, these reels handle baitcasting with ease. While you may hear a bit of a whir when casting and the brake system could be improved, this reel is a reliable choice for anglers on a budget. Swedish angling company Abu Garcia has put out many quality reels throughout the years, some more expensive than others. The Ambassadeur SX keeps up with the company’s high standards and also comes at a reasonable price point. This round baitcasting reel is created with high-quality machine-crafted aluminum. It features a bent handle design that is compact and easily accessible, preventing uncomfortable wrist tension. It comes in several different size models, including two left-hand options. 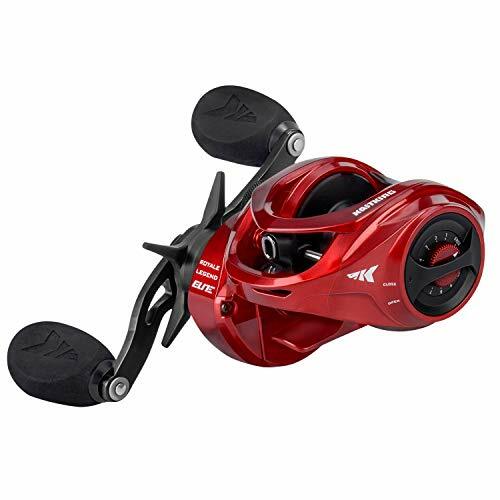 The reel’s thoughtfully created multi-disc drag system offers up to 12.5 pounds of stopping power. It also includes a six-pin centrifugal braking system, and three stainless steel bearings plus one roller. A fairly unique feature to Abu Garcia is the reel’s “synchronized level wind system.” This is a feature that assists in overall line lay, and also provides a smoother cast. 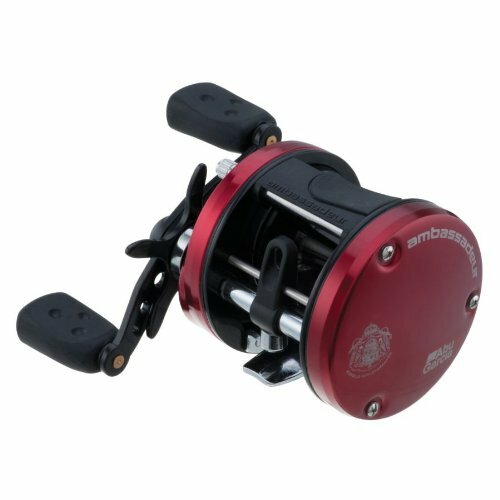 I wouldn’t hesitate to recommend Abu Garcia’s Ambassadeur SX baitcasting reel to any angler. With a wide range of desirable features, this reel gets the job done with style. The main complaint among users associated with this reel is the bait clicker, as it tends to stick or become stiff over time. All the other systems, including the drag and braking system, perform well. Inspired by the king of the ocean, the Great White Shark, KastKing’s MegaJaws baitcasting reel packs all the power that a great baitcasting reel should have. It’s a reel that stands out among others thanks to its shark-like appearance, including shark teeth on the front hood, fins on the side covers, and other rigid metal components. The MegaJaws baitcaster is similar to the Royale Legend mentioned above in a couple of different ways— it also features a compact, lightweight design. The line of reels also has the same color coding system for different gear ratios. Each of the four ratios is coordinated with a different color. 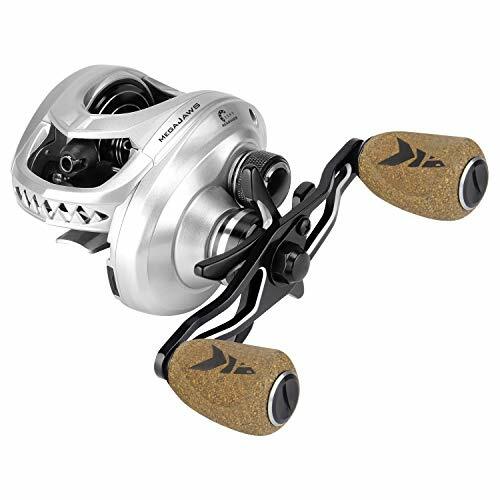 It features a carbon fiber disc drag system and 11 +1 stainless steel shielded ball bearings, allowing for super smooth casts and more than 17 pounds of drag pressure. A feature unique to KastKing that is included in this reel is the “low friction taped vortex.” It’s a funnel-shaped guide that cuts down on friction, providing for easy, long casting. 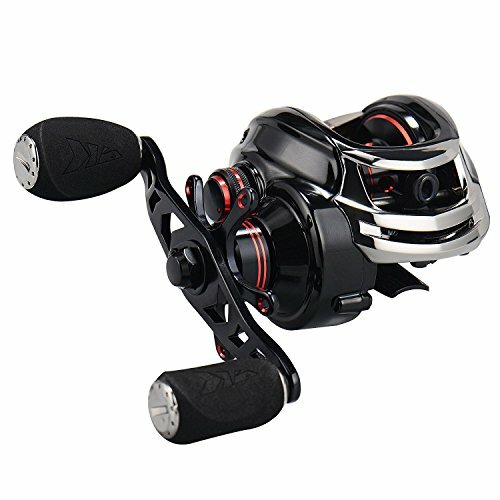 If you’re in search for a very cool reel that can handle big fish, look no further than the MegaJaws reel from KastKing. It’s got some great features, including a powerful drag and brake system, fast retrieval, smooth casting, and it’s surprisingly comfortable to use all day. While it could use a larger line capacity, the value of this reel can’t be beaten. Our third pick from KastKing is the lightweight and portable Royale Legend/Whitemax. Choose from the two low-profile models gear ratios: the Legend is 7.0:1, the Whitemax is 5.3:1. Similar to the other KastKing reels featured in this article, the Royale line included many features that anglers know and love from the company. They feature a carbon-fiber drag system that offers around 17 pounds of stopping power, thanks in part to its precision cut brass gears. The reel includes 11 ball bearings for smooth casting. They’re all created with stainless steel and are shielded for extra protection against salt, sand, or grime. 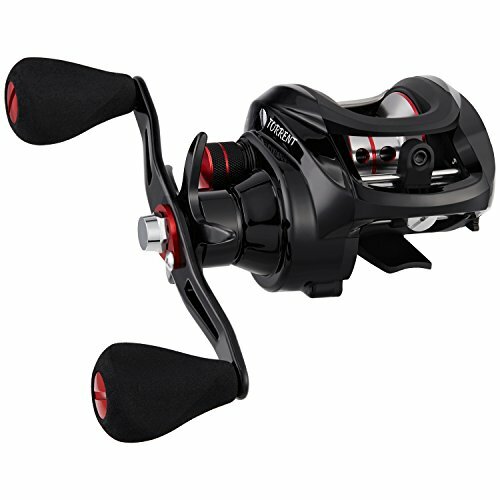 It also comes with an instant stop bearing clutch for better casting accuracy and control. The dual brake system uses a four-pin internal friction brake as well as a powerful 7-magnet for extra stopping power when it truly matters. Other features include high-quality EVA foam handles, an aircraft grade aluminum spool, and braid-resistant line guides. As we’ve seen in previous reviews, it’s pretty clear that KastKing knows their stuff. They consistently create affordable reels without compromising the quality of the product. This reel may require a little bit of maintenance before using, and some users have said it’s tough to clean, but performance-wise, it’s got a great dual braking system, as well as some other features that make it an attractive purchase. It’s no secret among anglers that the Piscifun Torrent is one of the best-of-the-best budget buys. Although Piscifun is a fairly new company to the angling world, they nailed it with this one. Like some other brands on our list, Piscifun is committed to affordable fishing products for all. Created with specialized Japanese Hamai precision cut gears and stainless steel screws and springs, the Torrent is crafted with durability and strength as the number one priority. It has a 7.1:1 gear ratio. The drag system included features a traditional disc drag system with three carbon fiber washers. The drag is easily adjusted by a simple knob on the side of the reel. It includes 5+1 ball bearings, which are each created with stainless steel and shielded for extra protection against dirt and debris. A fairly unique feature to the Torrent is its 0-10 magnetic braking system, which utilizes five magnets for maximum control and ease. Other features include an easily accessible oiling system, and double line winding shafts. Piscifun’s commitment to affordability and quality takes the cake with the Torrent reel. There’s really no wonder why many anglers rave about this product. It’s got some great systems in place, though some do say the drag could use a little more power. It offers smooth and easy casting, and it is remarkably easy to clean and maintain. Don’t let a tight budget stop you from angling success. As you’ve read in this article, it’s very possible to find a high-quality reel at a modest price. Keep your standards high, and you’ll be prepared to take on the toughest of fish. Happy fishing!